I catch the direct from Heathrow to Beijing Capital Airport, the sixth largest building in the world by area AND a third runway built in no-time-flat for the 2008 Olympics. Heathrow may get a third runway after 20 years in 20 years. I depart London on Saturday, 2PM, arriving in China on Sunday, 12 noon, a bit disorienting : travelling East always the difficult direction. At our hotel I swim on the 59th floor (the building once the tallest in China and now it is No. 2) before joining Stephane and Laurent for lunch on the 68th floor. At this height, inside an atrium, everything a bit weird like the trees or the floor-to-ceiling wine on display behind glass walls. 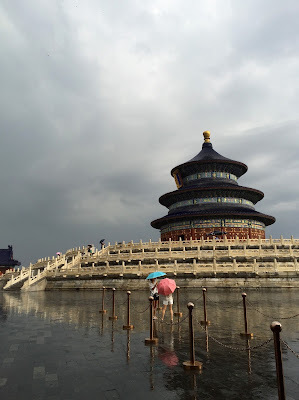 From the Park Hyatt we go to the Temple Of Heaven (pictured), a medieval complex of religious buildings visited by the Emperors of the Ming and Qing dynasties for annual ceremonies of prayer to Heaven for good harvest.